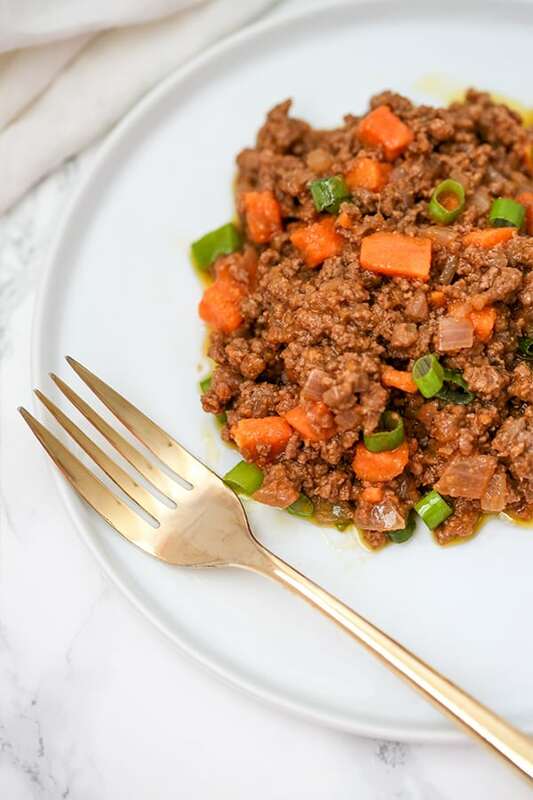 This paleo sloppy joe sweet potato skillet has all of the nostalgia of sloppy joe, but with real food ingredients! It can also easily be modified to be AIP. Who remembers sloppy joes?! Back when I was a kid and hated eating meat, I never really got the appeal of sloppy joe. Sure it was between two slices of bread which was always a plus to carb-loving kiddo like myself, but I just didn’t get the hype. It wasn’t until I got older and realized that there was sugar and a yummy sauce did I understand why people liked it so much! Sloppy joe may be nostalgic and comforting, but nothing about it really seems healthy. It’s loaded with sugar, likely artificial colors, and is usually eaten with white bread. It’s not exactly a salad. So, how do you turn this classic into a better for you dinner? 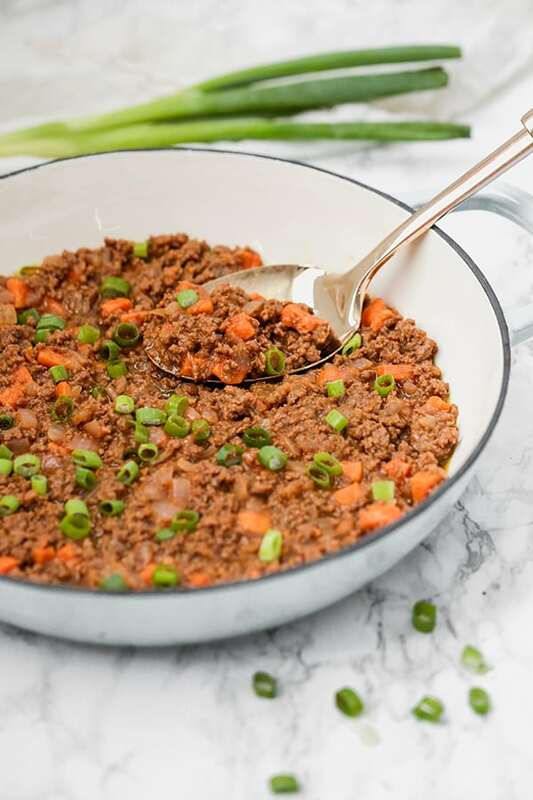 This sloppy joe skillet is made with a homemade sauce, veggies, and is yummy enough to stand alone without a bun! The addition of sweet potatoes to this skillet makes it more satiating and rounds it out to a more complete meal. My husband and I both enjoyed this on its own and didn’t need a bun substitute! Of course, you always could go ahead and stuff this sloppy joe skillet into sweet potatoes, or use sweet potato buns as a bun substitute, but it really does stand on its own. And honestly, why would you go through the whole extra step of prepping sweet potatoes separately when you can combine them with the sloppy joe to make it a one-pan meal? I’m always looking for ways to cut down on extra steps! 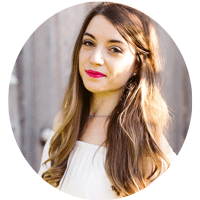 To round out the complete meal, you can try to pair it with a side salad, or a roasted veggie like broccoli. 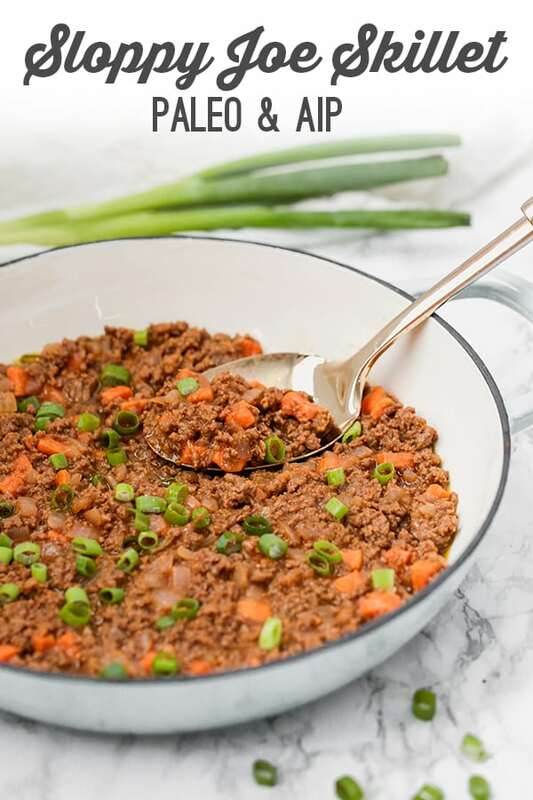 I highly recommend using high-quality grass-fed ground beef to get the most nutrient mileage out of this sloppy joe skillet. Grass-fed ground beef is more humane, nutrient dense, and it even tastes better. If you go for conventional ground beef, go for something that’s lower fat as toxins are stored in the fat. Rather than going for a bun substitute for this sloppy joe, I chose to combine diced sweet potato in with the sloppy joe. 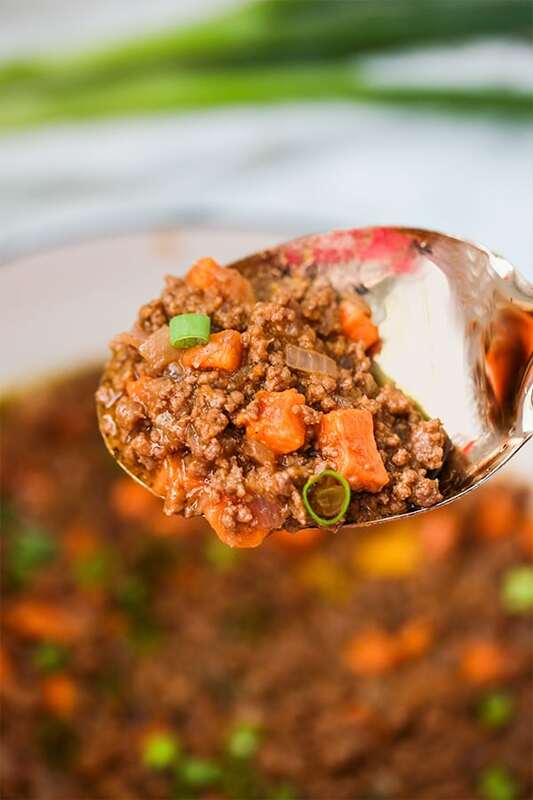 Not only does this make it a one pot meal, but it adds a bit more natural sweetness to the sloppy joe! Plus, I’m all for more veggies. Traditionally, there’s a tomato base to a sloppy joe, but as someone with a nightshade intolerance, I used nomato sauce. You can totally go with tomato instead if you tolerate it! Coconut sugar gives the sauce the signature sweetness of a sloppy joe without spiking your blood sugar up too high. Coconut aminos gives it that tang of worschecuir sauce. Using a large skillet, melt the cooking fat over medium heat and saute the sweet potato for 10 minutes, or until softened. Set aside and drain the fat from the pan. Add the chopped onion and ground beef to the clean pan and saute on medium heat. Use a wooden spoon or spatula to break up the ground beef into small crumbles. Stir until browned. Remove from heat and drain the majority of the fat from the pan. Add the sweet potato back to the beef and onion mixture and combine with the sauce. Stir until well combined. 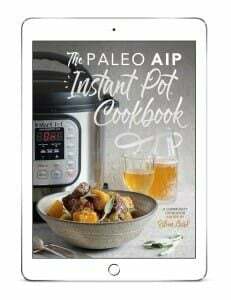 Simmer for 8-10 minutes. Remove the skillet from the heat and add green onion. Allow to cool and season further to taste. Combine all of the ingredients in a high-speed blender and blend until well combined. Set aside. If you’re not nightshade free or AIP, feel free to add bell peppers to the skillet as well! Thank you so much Hethyr!! So happy you like it. This really good,I like the low sugar content,since i’m Diabetic. My family loves Sloppy Joes and so I make them on a frequent basis for them and have been feeling left out, eating something totally different. I made this for myself last week on Sloppy Joe night and O.M.G. This was SO TASTY. My husband even said that he could definitely eat this instead moving forward (he isn’t on AIP). This is a keeper for sure! YAY! I’m so excited that everyone liked it!! Thank you so much, Melanie!